Edible landscaping provides both beauty and function to the home garden. Whether it is to supply the family and neighbors with fresh fruit and nuts or to sell the fruits of their labor commercially, growing fruits and nuts in the home landscape has become popular. Gardeners with clay soil are limited in the variety of crops they can grow, but there are several fruit and nut trees that will grow in clay soil. It is not at all uncommon to find a 200-year-old black walnut tree (Juglans nigra), according to forestry experts at the University of Minnesota. Therefore, the planting site will be an important consideration if you are planning on growing a black walnut. 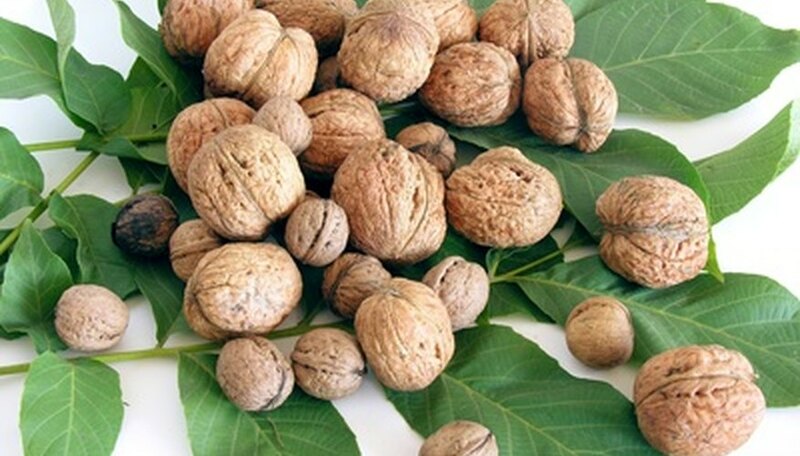 Black walnut trees are valued for wood products such as furniture, and the nuts are popular in baked goods. The black walnut tree prefers a clay-loam soil with a pH above 7. Black walnut trees do best in USDA Hardiness Zones 4 to 9. Once a dietary staple of Native Americans, shagbark hickory nuts aren't produced by the tree (Carya ovata) until it reaches maturity at 40 years. Prime nut bearing occurs between 60 and 200 years of age, so plan on planting this one for the grandkids to enjoy. Although the shagbark hickory is adaptable to many regions and soils, it grows best in areas with high humidity and clay soil in USDA Hardiness Zones 5 through 8a. The apple tree is adaptable to many soil textures, from sandy loam to clay. When planting the apple tree in clay soil, crop specialists at Ohio State University recommend that you plant it 2 to 4 inches higher than it was growing in the nursery. This allows more air circulation in the root system. Plant bare root trees in the ground in March or April, or plant container-grown apple trees any time. New apple trees require lots of water; plan on supplying them with 2 to 3 gallons of water every two weeks. If you have had trouble in the past growing plum trees in your clay soil, consider the chickasaw plum (Prunus angustifolia). Not only does it produce delicious fruit, but the tree also makes a striking specimen planting. In early spring, while other trees remain dormant, the chickasaw plum tree bursts into bloom with white, fragrant flowers. The plums are 1/2 inch in diameter and ripen to yellow. A native to North America, the chickasaw plum does best when planted in USDA Hardiness Zones 6 through 9 and will do fine in clay soil.